December 6, 1969 the Rolling Stones played a free concert at Altamont Raceway outside of San Francisco. Mick Jagger put on as good of a show as I've ever seen. As the Stones rocked the crowd fell back at about a 30 degree angle, forward to about 25. I was sure Mick controlled the entire crowd as the levels climbed, then calmed before people got hurt or killed, notwithstanding Meredith Hunter charging the stage with a gun. 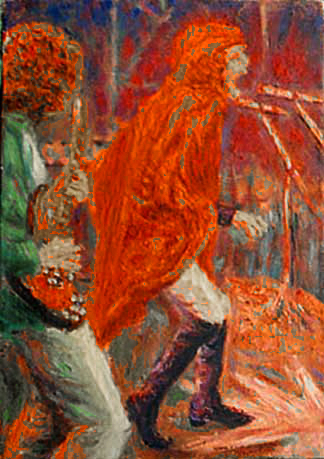 This is the study I used for Mick for my painting of the Altamont concert.